As if such mega weapons as the 120mm gun on an M1 Abrams or the A10 Warthog’s Vulcan cannon weren’t enough, defence contractor General Atomics just carried another test for the U.S. Navy’s latest ultra long range armor piercing weapon–the railgun. Its pet name is the Blitzer and oh boy, does it blitz. There’s been coverage of railgun tests here at Geeky Gadgets before, but wait, this one’s different. Instead of using brick shaped projectiles, Boeing has come up with an experimental rocket shaped round that literally burns through armor plate. Railguns have been the stuff of geeky speculation for years. It wasn’t until the last decade, however, that the U.S. Navy considered it an essential addition to its future arsenal. 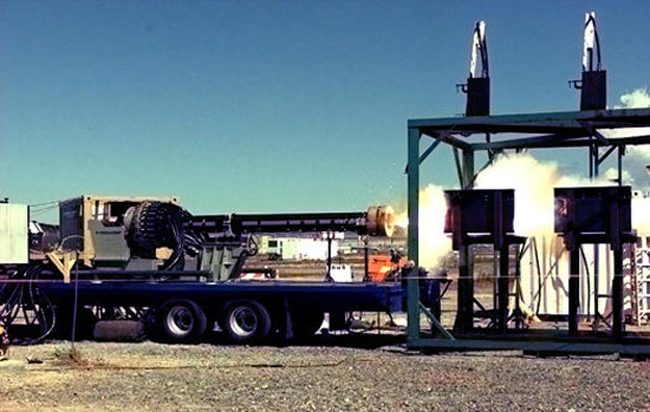 Unlike current artillery, railguns can defy the usual constraints of large caliber weapons. Range is phenomenal and the destructive power is awesome. For this particular test, the people at General Atomics tested the Boeng made round somewher ein the middle of the desert. Fired from a gun at zero elevation (meaning fired straight), the silvery bullet ripped through a 1/8 sheet of armor at Mach 5. That’s no joke, boys and girls. If the round were any bigger and the targer was a tank, the tank would be smoking mulch. A fully operational railgun won’t be viable in several years more and railguns will probably be installed on a few destroyers by the end of the decade. In the meantime, the People’s Republic of China are building a huge fleet of super-sized aircraft carriers. Ach! What is our world coming to?